With the destiny of the NASL Spring Season title in their hands, the New York Cosmos fell to the Fort Lauderdale Strikers 2-0 on Saturday with goals from Jose Angulo and Geison Moura. This left the fate of the Spring Season to the rest of the league, bringing us back for yet another full run down of all the scenarios left as the Spring rolls into its final week. All hope is not lost for the boys in green, as a draw by Carolina and shocking loss by Minnesota eliminated both clubs from Spring Season contention. Even more surprising was a draw by Indy Eleven in Miami, bringing the fate of the Spring Season to be brought down to goal differential. 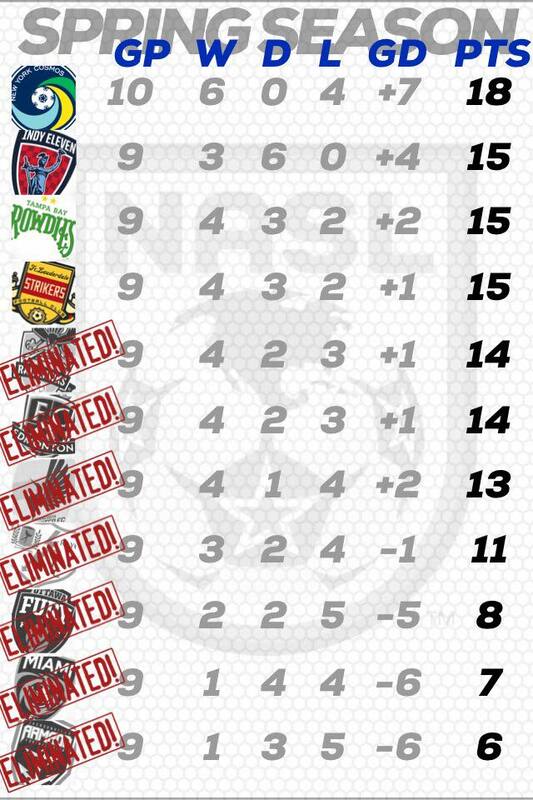 Here’s a look at the table going into the final week. Indy Eleven, Fort Lauderdale, and Tampa Bay all stand level on 15 points with one game to play. How can each of these clubs win the Spring Season? Let’s take a look.